Avoid sign ordinances with these Under Hood Signs! They work great to draw attention to your front line. 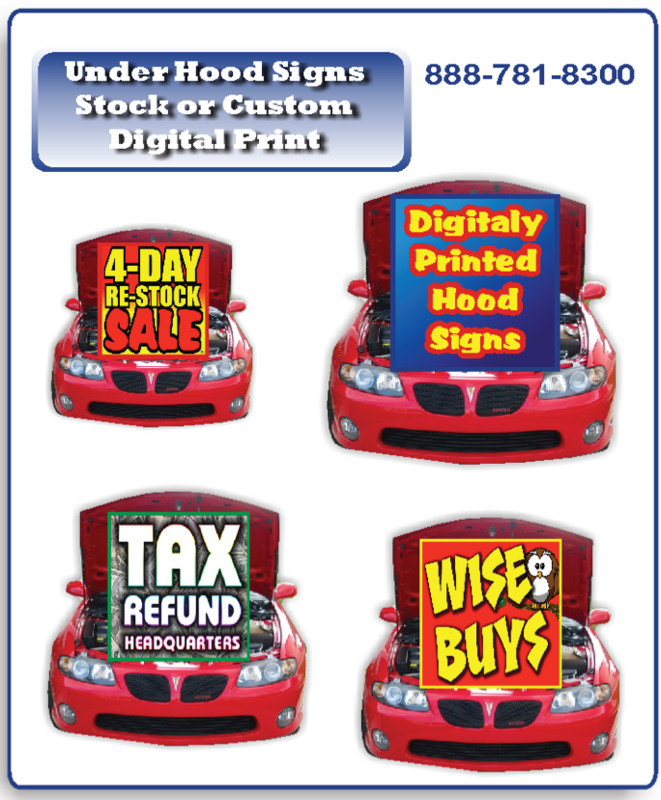 Hood Signs are printed with full color UV resistant ink for longevity. Simply open the hood, and insert the sign under the hood! Under the hood signs will not hold up a hood, the hood must be held up by the vehicle’s hood support. Custom Printed Full Color \Hood Signs are very reasonably priced, allowing you to change the message when you want! For years auto dealers have made great use of under hood signs to show off their front line. The dealers front line is their lifeblood. Most of the dealer’s business is coming in from the road, so what better place for a sign than under the hood. Hood Sign dimensions can be customized, but stock signs are 30″ wide by 42″ tall. Made from standard coroplast sign board, under the hood signs can last for years, if they are taken care of. Also, hood signs can be upgraded to a thicker material, to maintain a longer life span, or if you are planning on roughing up your signs!